Words are powerful. Words mean things. Just seeing a certain word can be a motivating experience. That is the idea behind, “Five Minute Motivators.” Power words on a card that you can take anywhere, put anywhere, motivate anywhere. You print these power words double sided on standard Avery business cards. Break them apart and clip them together. Slip them in your pocket or purse. When you get to work place a power word on your monitor to motivate you through the day. Put one on the top row of your keyboard to remind you of something important. Put one on the refrigerator door to help you stay on your diet. Simple, yet effective, power words can help you reach your goal or create that new habit… fast. 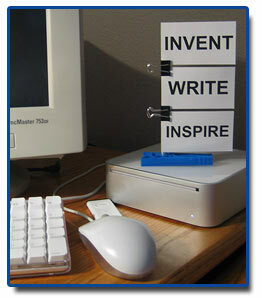 You can even create a “motivation station” on your desk that will keep you focused during the day. Using simple materials such as a clothes pin, mini clips, and a pencil, you’ll have a tower of power on your desk in no time. The Five Minute Motivators work seamlessly with a standard Walleteer. Add a card to the top of the stack and you’ll be reminded of an important theme throughout the day. These power cards are also totally customizable. Add color, change the font, and add some pizzazz. Change the cards quickly in Microsoft Word. Feeling blue? Print a power word in blue or add one in red to lift your spirits. Want a new word? Add it quickly to the blank card provided with a Sharpie marker. 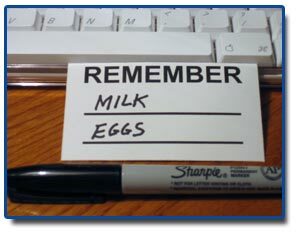 Your spouse just called and wants you to remember to bring home milk… Just add it to your remember card. Like string around your finger, the remember card tapes easily to your car dash so you will remember to stop at the store on your way home. The “take it with you” card is a great reminder by the front door. Write down those things you always forget… keys, lunch, or notebook and put them on the card. When you walk out the front door you’ll see the card and be reminded to take them with you. Create your power stack in just minutes. Download the Power Template and unzip the file. Powerful words at your fingertips. Put them in strategic places and you’ll be amazed how simple little words can have a profound effect on your life. Just imagine the look of joy on your spouse’s face when you actually remember to bring home the milk. Priceless!